Rapid Prototyping is a fundamental phase of the Product Development Process. It provides Marketing Managers, Production Managers, Purchasing Agents, etc. with a hands on example of the product. This gives these key people an opportunity to play a roll in the development process, which can save months of work, and speed the completion of the project. We fabricate prototypes in-house using several forms rapid prototyping processes. We also outsource prototyping for more precision products. 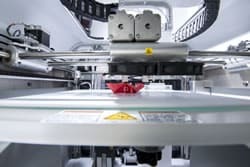 Our vendors range from stereolithography and 3D printing for plastic components to CNC (Computer Numerical Control) and rapid sheet metal prototyping. With a large list of certified vendors, we can fabricate prototypes for any project at a reasonable price. Our in-house prototyping processes include 3D printing, Silicon Molding for plastic components, and light machining process. We use prototypes to test for product design compliance, and many of our customers use them for marketing. A realistic prototype can be used to sell your idea to perspective distributors and investors. Need your product 3D printed and then tested? We can print your models, or we can create models and then print them. Contact us today. We’ll be happy to talk with you about your project.